I'm been having a lot of trouble with the format for the interval file input to GATK. I've gotten 3 different errors from different versions of interval files that I've tried. It would be really helpful to get some pointers for where I might be going wrong. The file that I was using for this is hg19.list.txt (when I run the tool, the file extension is .list, but the forum wouldn't let me upload it). MuTect has been fine running with an example file that I pulled off of the ftp site (hg19examplelist.txt), but when I compare both files, I don't see a major difference in the format. To create hg19.list.txt I followed the directions from the FAQ and pulled the header information from my reference dict file and added my intervals. MuTect returns Error 1 with hg19examplelist.txt, but not hg19list.txt. WARN 15:33:54,967 GenomeAnalysisEngine - The given combination of -L and -XL options results in an empty set. No intervals to process. I've mostly gotten this error when I tried to run the intervals information in bed format. After seeing this, I'm thinking that I might be misunderstanding what the interval file is for, even after looking at both FAQs. Are these the intervals that MuTect will be looking at or something generated from the sequencing process? If it helps any, I did not create these bam files, they are from someone else in my lab. I'm running java 1.7 (this error does not always show up). It would be helpful to know why this might occur with some .list files and not others. That looks like a MuTect-specific bug, so I'll hand you over to @kcibul, the author of MuTect, who will be able to help you with this. He will need to know what version you are running with and what was your exact command line. Yes, I tried files in two of the formats mentioned by the FAQ: picard style interval list and bed. I'm getting the @HD VN:1.0 SO:coordinate error even though that line is present in the example in the FAQ. Also neither FAQ states where the intervals themselves come from or how they are used by mutect. Thank you for your help. Make sure your intervals list is named with either extension .bed or .list as appropriate; it cannot end in .txt. The program gets confused, thinks header lines are intervals and doesn't parse the file correctly. For the record, the simplest format for intervals (which I prefer, personally) is the <chr>:<start>-<stop> format, which doesn't require a sequence dictionary. The intervals list specifies which regions of the genome the analysis will be run on. I can't comment on how it's used in MuTect, but in GATK it's typically used to restrict analysis to exome capture targets, or to particular regions of interest. WARN  13:41:41,742 IntervalUtils - The interval file ../hg19param/intervals.bed contains no intervals that could be parsed. WARN  13:41:41,744 GenomeAnalysisEngine - The given combination of -L and -XL options results in an empty set. No intervals to process. That's odd. Can you tell me how you are generating the intervals file? Are you doing it in the shell using Unix tools, a GUI text editor, or something else? I've been using vi. I don't think there are any extra characters, I'm attaching a screenshot of how it looks in the editor. Thank you! 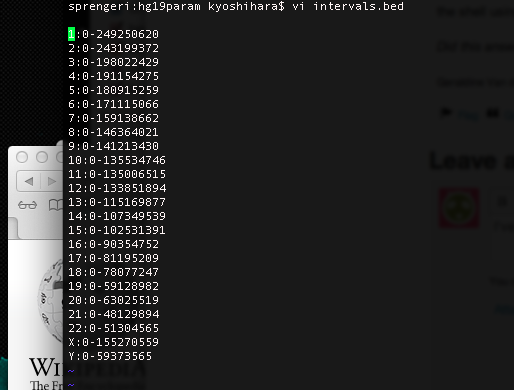 Oh, if you have the intervals in that format the extension needs to be .interval_list or .list, not bed. You'll need to change the starting zeroes to ones. Sorry, the formatting requirements are a bit obscure, I realize. Thank you, that file is working now. I'm really sorry for all of the questions, but now I'm getting the third error in my original post - Comparison method violates its general contract!. Is it having trouble with a part of the bam file at chr1:564568 or is this still an input error? Thank you! Thank you, Geraldine and Kcibul - I'm not allowed to run Java 6 on my university computer, so I tried to build from the source. Never mind, it seems to be working now. If anyone else gets this same error, the problem was that I was using Ant 1.9 and not Ant 1.8.X.